We just launched a new feature that we believe will enhance the PriceHub user experience. 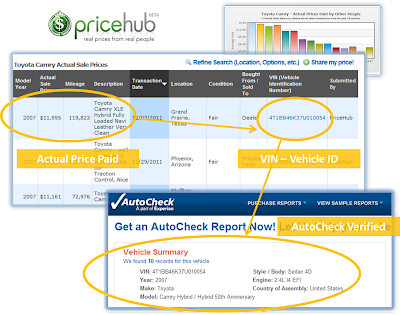 Moving forward, with many of our actual price paid data points, we're now including the VIN (Vehicle Identification Number) for the vehicle. Now you'll be able to see each actual price record tied to a specific vehicle (not just a random estimate or guess that other car pricing sites use). You'll also be able to verify some of the core details of the car through AutoCheck, an Experian company that provides vehicle history reports. Here is a screenshot of our new feature. Please be patient with us as our car pricing data continues to grow. Thanks for your support!